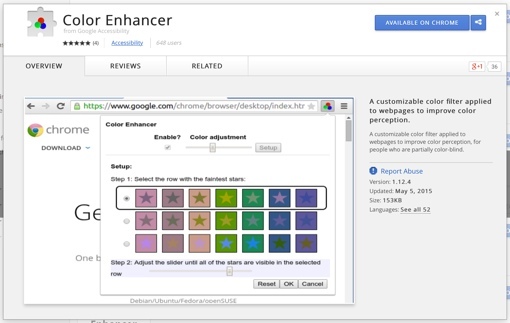 Here’s a big announcement from Google that will improve the Internet experience of a lot of people: This week, the tech giant released a new extension for its Chrome browser called Color Enhancer that shifts color schemes on webpages to be better recognized by the color-blind. The extension is a light download (153KB) and install, plus it’s easy to set up. You simply choose between three rows of stars to tell Color Enhancer which is the most difficult for you to see. Then, you take control of a slider bar, which you adjust until you can see all the stars in that row. Color Enhancer is a great tool – numerous reviewers say that it helps them pass the Ishihara Color Test (the one with numbers and dots). Take note that it might not work for every distinct type of color-blindness, though.